Today i'll share with you my recipe and my way of making sableé cookies or short dough cookies a very tasty for your afternoon tea time. The dough is a little less sweet than a sugar cookie dough and a little less rich than shortbread dough, and it's perfect to hold soft fillings like pastry cream or fresh fruit jam without getting soggy. To do this easy recipe you have just to mix butter with sugar, add egg and flour.Chill then cut and bake. The final dough bakes up with a nice delicious crispy bites. 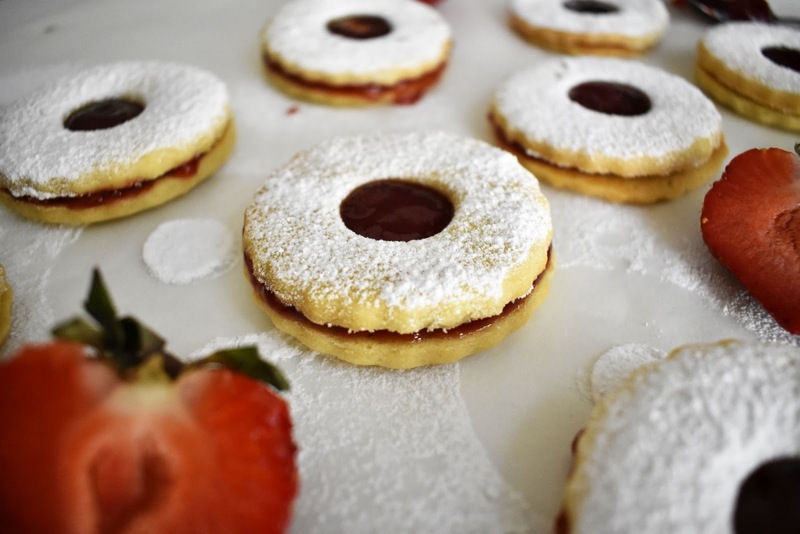 These yummy cookies have many names such as pâte sableé, sweet dough, short dough , tart jam and tart dough. Well, call it with any names the result is one (delicious cookies). In a large bowl, cream butter with sugar until combined. add the egg and vanilla, mix with a wooden spoon until well combine. Add flour into two phases, knead into a ball. Flatten the dough, cover with plastic wrap, refridgrate for 2 hours. Cut as a circle with sableé cutter, i use decorating tip to make the middle circle. Bake in a preheated oven 170°C for 13-15 minutes. Sprinkle confectioners sugar at the top when it out of oven. Cool down before fill it with jam.